Health care is easier with us on your team. What matters most to you, matters most to us. Check out what people are saying. Choosing the right care when you need it. Saving you time and money – with no surprises along the way. Understanding your plan and getting the most out of it. Personalized help – even before you ask. Our advanced analytics help us understand you and your plan, and anticipate what you may need – from saving money on a prescription to getting started with exercise. So, we can give you proactive guidance. No matter how you like to connect. Just download and open the latest version of the myCigna℠ App. * The Cigna One Guide service is built-in. We can answer any questions as they pop up. So, click away. On myCigna.com or in the App. Want to talk? If you like that personal touch, give us a ring. There’s an easy one-touch call feature right in the App too. Not a Cigna One Guide customer yet? 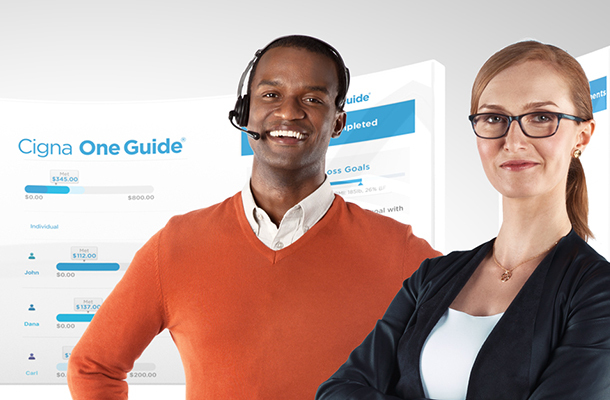 Already a Cigna One Guide customer and had a great experience? "She did something that no one else has ever done. I have been going around with all these groups for an MRI, including all the medical centers, and she worked miracles. She got me the right care and to the right place. I want to give her a giant hug! You’ve got somebody awesome! Thank you!" "What an excellent, thorough job she did for me with eligibility and provider issues and questions … she really exceeded my expectations!" "I have some serious medical problems and she just really helped me iron them out and find a doctor, so again, I just wanted to thank you for her because she’s a wonderful asset to Cigna." "Phenomenal! She went out of her way to help me with all my questions." "I want to sing her praises and tell you how fantastic she was and that she was really a champion for me." "He went over and beyond by calling out to the hospital to assist me." "I am going to make a commercial for you all and sing your praises to everybody I know." *Actual customer quotes provided to Cigna. Covered services and benefits vary by plan. "She was an awesome customer service representative – she saved me money and offered me solutions. She offered me a lot … KUDOS!" "She has been going back and forth with the provider to get a corrected claim submitted. She did an amazing job." "I never had someone take the initiative and be as proactive with the information as she was." "He helped me out with questions about my HSA debit card and provided me with good information on benefits, some of which I wasn’t aware of." "He helped me so much with my billing issues – he’s taking care of everything. Thank you so much!" "It was an awesome experience. I am feeling really happy that I am insured by you." "She went above and beyond! She called me back, and I didn’t even ask her to." "This was the best service I have ever had. She was wonderful. She took time … and explained everything about my benefit package." "I didn’t have to guess my way through the call because she was answering questions I didn’t even know to ask." "Andrea was amazing! Not only did she reach out to the provider for me to get one of my husband’s bills taken care of, she helped us realize we have incentives we can earn if my husband gets his preventive care check-up. That was awesome! She not only looked into our bills, she helped us save a little extra money!" "My experience was outstanding! John was helpful, clear to understand, and I want to send him a gold star." "He went beyond and helped me to understand each plan. He was wonderful and beyond fabulous!" "She assisted me … and advised me of different incentives and the programs I had at my disposal. High praise for the time and effort she spent with me. It really helped! Thank you!" "She was fantastic. She broke down all of my questions and outlined what my plan does. Then she compared it to other options for the year." Personal guides are available 8:00 am–9:00 pm EST. Customer service representatives are available 24/7/365 to answer simple questions and help you find the right resources.